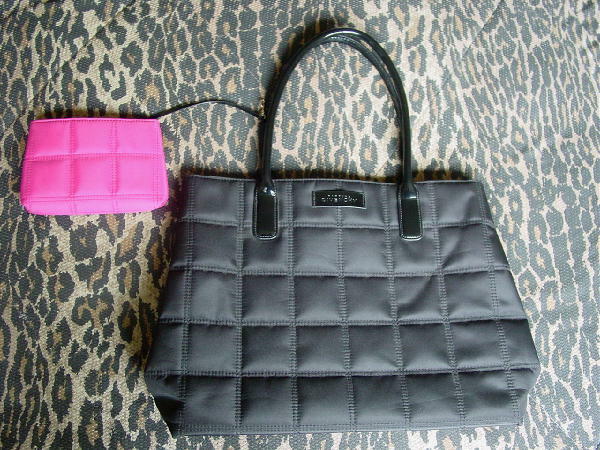 This large black carryall bag has a quilted box stitched pattern and is by Parfums Givenchy. It's 87% polyester and 13% PVC and you wipe clean only. 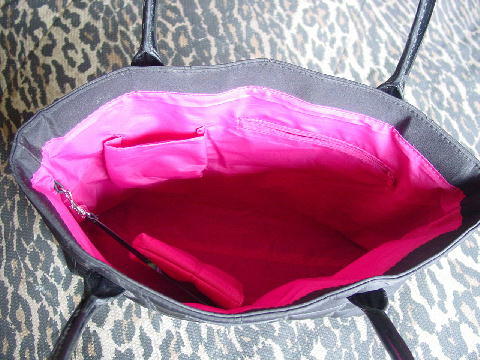 The interior has a hot pink with a touch of magenta lining with a zippered section and an open pocket for your glasses or cell phone. It also has a color-matching (lining) makeup bag with the same quilted box stitched pattern with a black fabric lining (wipe clean only) and is 95% polyester and 5% PVC. 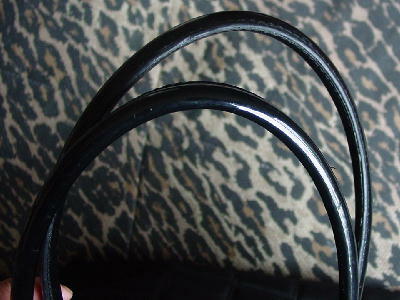 You attach it to the purse by the little safety hook to the ring on the interior upper side seam. The bottom seam has a small dark spot near the right corner. The purse has two 21 1/2" long padded handles. The back inner sides of both handles are not as shiny, because of the handles rubbing against each other. It's not really noticeable when the purse is being carried. There is a 2 3/4" by 3/4" black PVC tab on the upper front that has an etched Parfums Givenchy on it. It's nice and light weight, and it can hold quite a bit. It's from a stylist's inventory, and was used once, in an ad.